After an interview, you should always send a thank you letter to the hiring manager. A prompt follow up is not only professional, but it also allows you another chance to demonstrate your interest in the position. Today you are going to write and send thank you letters to every employer with whom you have interviewed. Below are some tips on when and how to send your thank you letters. Send your thank you letters as soon as possible after your interviews – about 24 hours after the interview is best. If you need to reach out to an employer even sooner than that, consider sending an email thank you letter, or even making a thank you phone call. In general, employers prefer typed thank you letters (either email or paper). However, some organizations like the personal touch of a handwritten note. Think about the nature of the interview and the company culture. For example, if you hit it off with the interviewer right away, or if the company has a more informal, casual culture, a handwritten note might be appropriate. 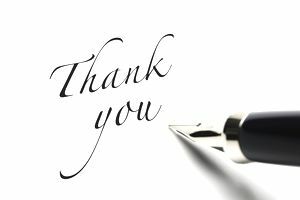 A thank you letter is a great place to reiterate your interest in the job. You may want to restate why you want the job and what contributions you can make to the company. If you forgot to share something important during the interview, or if you want to expand on something you said, you can do so in the thank you letter. Here is a thank you letter template to help you structure your letter, and here are some sample thank you letters to get you started. If you felt that the employer had specific reservations about your qualifications, or if you felt the interview did not go well, you might consider writing an influence letter. An influence letter is slightly longer than a typical thank you letter. It allows you the space to explain in detail your qualifications, and how you can meet the employer’s needs. Be sure to edit your letters before sending them. This is the last document an employer likely will see before deciding whether to hire you, so make sure it is well written, with no grammar or spelling mistakes. If you have not done so already, now is also the time to thank everyone else who has helped you with your job search. Be sure to send thank you letters to people who wrote you recommendations, family members and friends who helped you find job openings, and anyone who gave you an informational interview. Here are thank you letter samples for a variety of job search situations.